Showing 37 articles from February 19, 2013. Something ‘illegal’ messing up new radio system? FRANKLIN COUNTY — Federal communication experts were expected to begin work this week, looking to find the source of interference that’s plaguing a nearly $11 million communications system. During a board meeting on Monday when the new system was tested, an old problem reared its head. 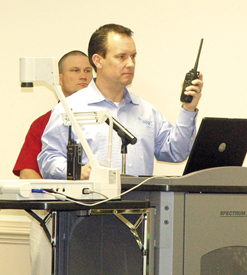 Engineers with Harris Corporation and consultants have been working since October to find the source of dropped calls, garbled audio and other issues that officers have experienced while being patched into the new radio system. LOUISBURG — Reluctantly, county commissioners agreed to make the final payment for a countywide revaluation that drew the ire of property owners for its wildly inconsistent values. They were able to cut that final payment in half. 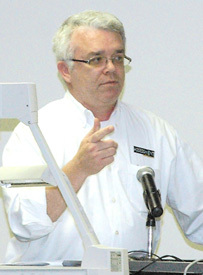 Following a closed session on Monday night, the board voted unanimously to pay Tim Cain and his Assessment Solutions company the final portion of a $682,713 contract. YOUNGSVILLE — Town finances have come a long way. Tara Roberson, a certified public accountant, presented commissioners with an audit report that saw the town’s savings account go from the red to black in a year’s time. 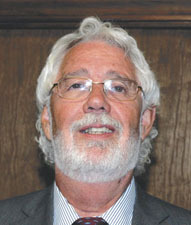 “It’s a large improvement,” Roberson told commissioners during the board’s meeting on Feb. 14. “I suggest you work to continue that rainy day fund. A proposal to create a Tar River Center for History and Culture that would, among other goals, focus on economic development, received a promise that Louisburg town officials would take a closer look at the request even after one council member questioned it. The idea was presented by Louisburg College President Mark La Branche, who noted that this area is rich in culture and history dating back to the American Indian. The college president said the school is about to close on repurchase of three student residence halls, using a USDA 30-year loan at 3.125 percent. Enough winter already, bring on the ‘skeeters! 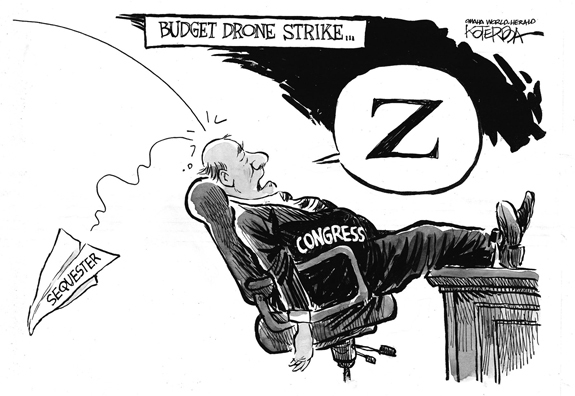 GOOD MORNING: OK folks, that weekend snow dusting we received does it as far as I’m personally concerned. While, up until now, this winter was one of our milder ones, I’m ready for spring any day now. Bring on the hot sunshine, gnats, mosquitoes, etc. so that I’ll have something else to complain about. It’s obvious that the county’s highly touted new communications system is not working as promised, at least part of the time. That leaves several questions, the most obvious of which may actually be the least important! The most obvious question is how in the world we got into this situation — and why did we think we were so much smarter than everyone around us? I guess it’s not really breaking news to say that, as a reporter, I’m skeptical. Cynical is another way of putting it. There are others that would probably use the word negative. I disagree, but that’s being negative, ain’t it? Why are we backing down? Did you know? As you walk up the steps to the building which houses the U.S. Supreme Court you can see near the top of the building a row of the world’s law givers and each one is facing one in the middle who is facing forward with a full frontal view. It is Moses and he is holding the Ten Commandments! FRANKLINTON - Jane J. Penney, 62, died Friday, Feb. 15, 2013. Cremation Society of NC, Raleigh. LOUISBURG - Beulah Mae Edwards Joyner, 79, of Louisburg died Monday, February 18, 2013 at Wake Medical Center. She was preceded in death by her husband, Harold “Snook” Joyner; her two sons, Charles Felton and Michael Junior Joyner; and several brothers. THUNDER FROM TERENCE. 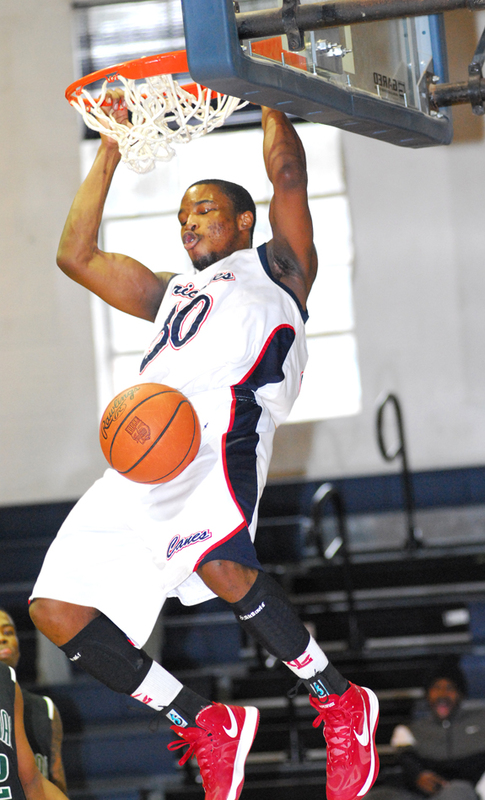 Louisburg College frontliner Terence Christian throws down an alley-oop last Saturday afternoon against Rockingham CC. LOUISBURG -- Things don’t necessarily go as planned -- even at the most organized college basketball programs in the country. Sometimes, that’s not necessarily a bad thing. Consider the rotation for the Louisburg College men’s basketball squad under veteran Coach Mark Vanderslice. DRIVE TIME. 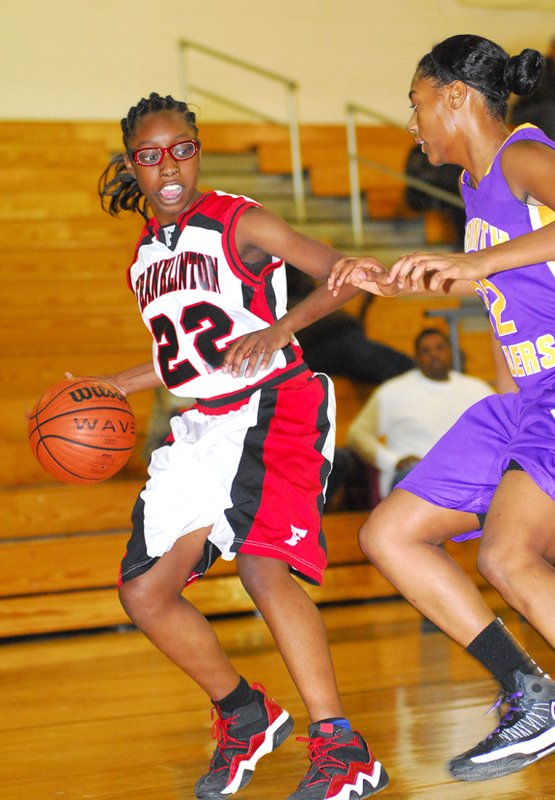 Franklinton’s Lanesha Hawkins (left) makes her way to the basket during Monday’s league tournament victory against Corinth Holders. 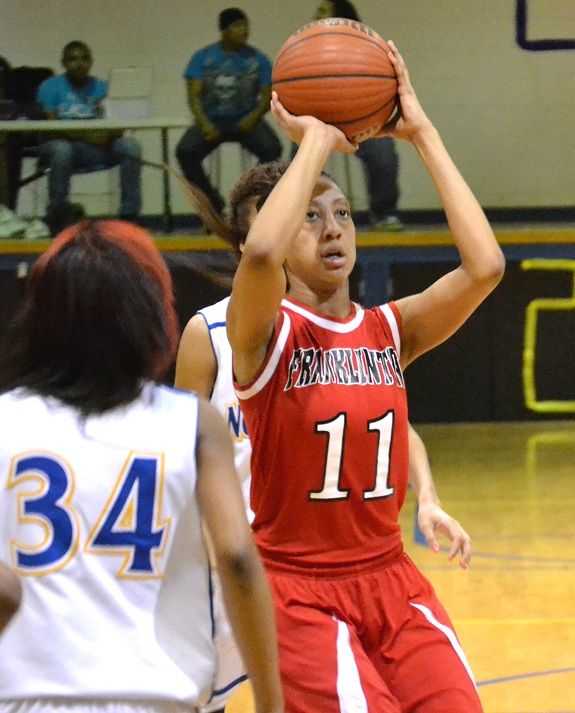 BUNN -- Franklinton registered 18 points in the first 29 minutes of Monday’s meeting with Corinth Holders in the first round of the Northern Carolina Conference Girls Basketball Tournament. But the Lady Rams saved their best for when they needed it the most, delivering 12 points in a row over the closing three minutes to outlast the Lady Pirates 30-22 at the Bunn Dome. KENLY -- Three days after their most devastating loss of the season, the Louisburg Lady Warriors responded with their most important victory of 2012-13 during Monday’s first round of the Northern Carolina Conference Girls Basketball Tournament. LHS dropped out of a guaranteed spot in the Class 2-A State Playoffs following last Friday’s regular season finale at home against Corinth Holders. BUNN -- These are busy times for Whitney Bunn, and that’s just the way she likes it. 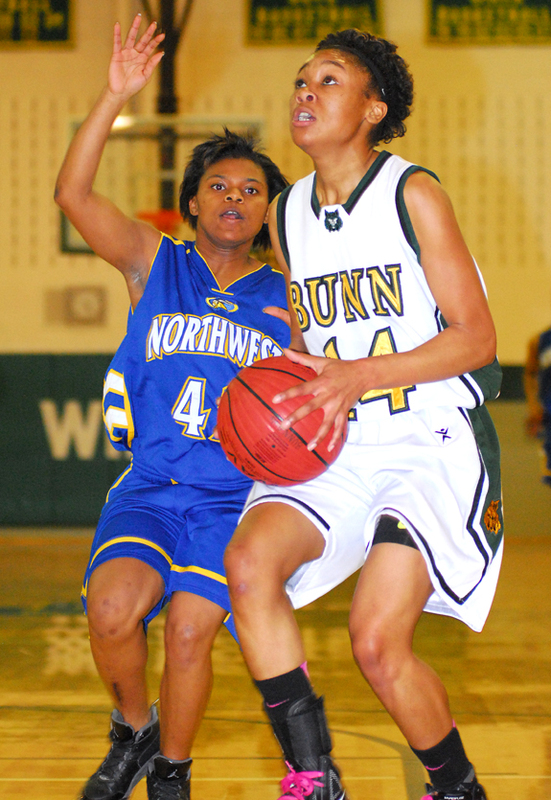 Bunn, a senior girls basketball standout at Bunn High School, has led the Ladycats through an undefeated regular season (again) in the Northern Carolina Conference, and BHS is the No. 1 seed for this week’s NCC Tournament. 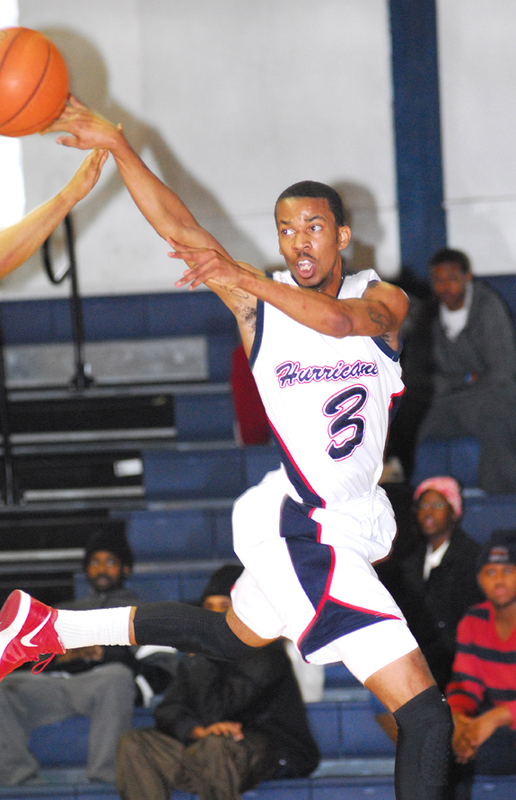 HENDERSON -- The 2012-2013 Vance-Granville Community College men’s basketball season is history, and first-year head coach Mike Rotolo feels pleased with the foundation the Vanguards laid during the past rebuilding year. 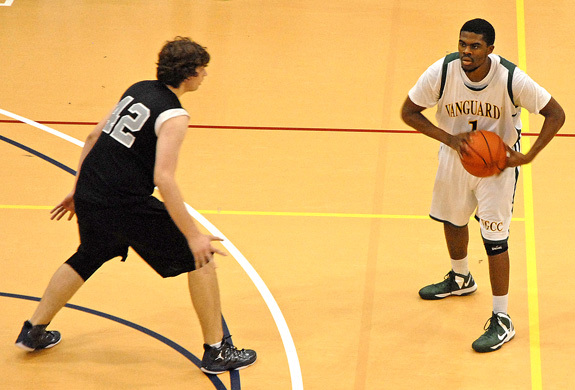 The 2-15 Vanguards played a tough schedule against high-quality opponents. STRONG TO BUCKET. Bunn’s Tainasha Vines (right) won’t be denied on this drive to the basket during Monday’s home victory over Northwest Halifax in the first round of the NCC Hoops Tournament. BUNN -- No more Mr. Nice Guy. That was the message sent by Bunn High School girls basketball coach Benj Daniels to current and future opponents during the first half of Monday’s meeting with Northwest Halifax in the opening round of the Northern Carolina Conference Tournament. 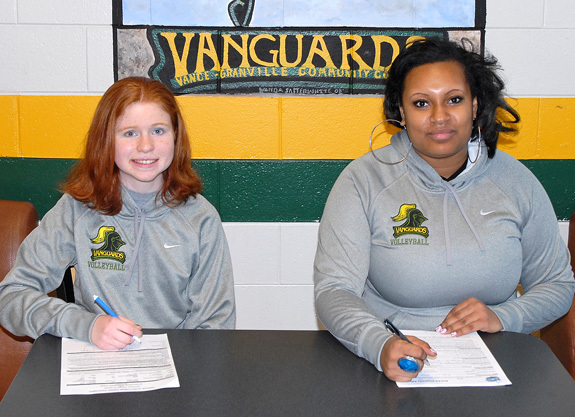 HENDERSON -- Two new recruits recently signed up to join the Vance-Granville Community College women’s volleyball team for the Vanguards’ 2013 season. The first signee, Imani Guy of Kittrell, is a VGCC School-Age Education major. Guy (5’8”) is originally from Boston where she played volleyball for one season at the historic English High School. 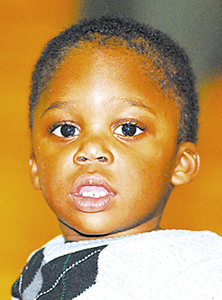 GREENSBORO -- North Carolina rosters have been finalized for the 2013 Carolinaa Classic All-Star Basketball Games. The event, which features boys and girls games featuring the best prep seniors from North Carolina and South Carolina, will be played March 23 at Socastee High School near Myrtle Beach. 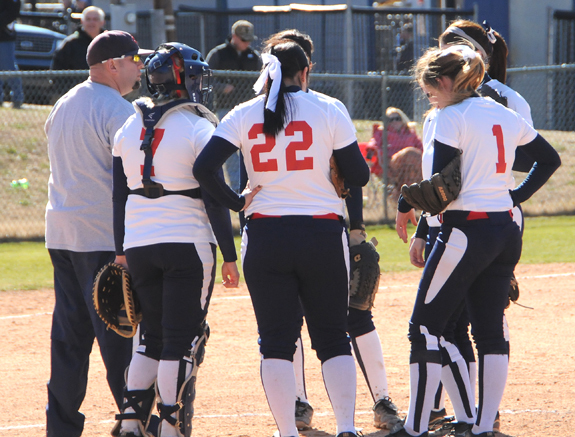 LOUISBURG -- The Louisburg College softball team improved its early-season record to 4-0 with a pair of non-conference wins over Southeastern CC last Friday at Sheilah R. Cotten Field on the LC campus. The Lady ‘Canes took game one 14-1 as they pounded out 13 total hits. LC increased its hits total to 16 in game two as the Lady Hurricanes won the nightcap by a 20-7 tally. Louisburg College’s Antonio Robinson delivers a pass to a teammate during last Saturday afternoon’s home triumph against Rockingham Community College. 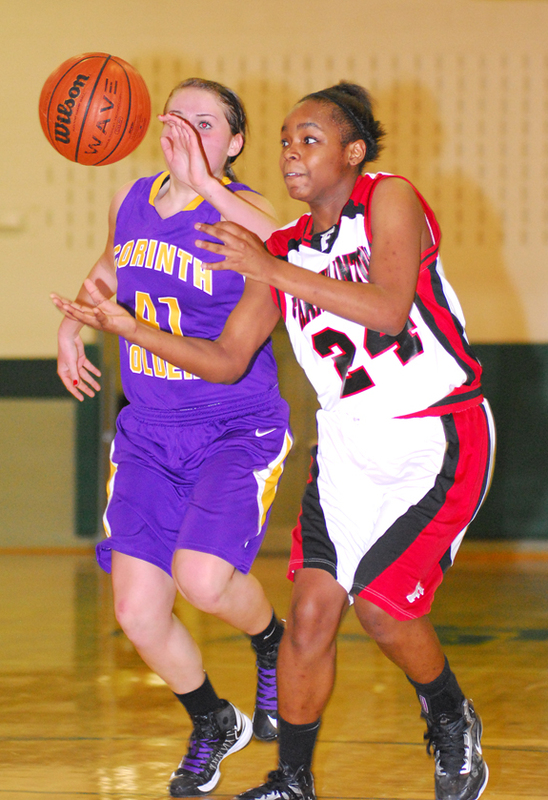 Franklinton’s Tanisha Wall (right) comes up with a loose ball during Monday’s decision over Corinth Holders in the first round of the NCC Girls Basketball Tournament at Bunn. 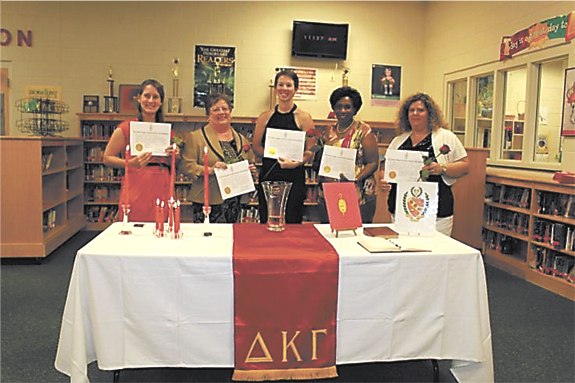 The Delta Kappa Gamma Society International for Key Women Educators, Eta State (NC) Organization and local chapter Gamma Tau of Franklin County initiated five new members for 2012-2013. The initiation took place at Bunn Middle School. The mission of DKG is to promote professional and personal growth of women educators and excellence in education. 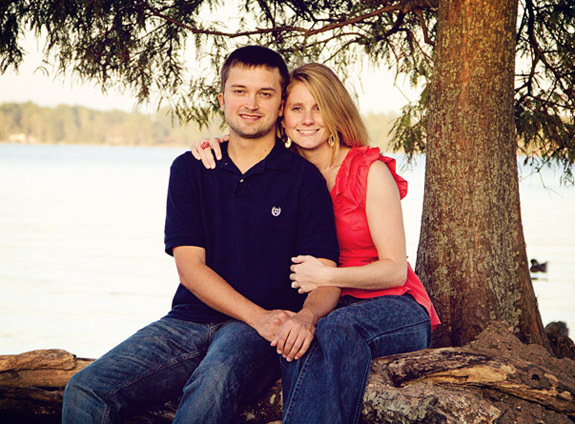 Mr. and Mrs. Anthony Sledge of Louisburg announce the engagement of their daughter, Kelsey Erin, to Jonathan Aaron Toler, son of Mr. and Mrs. John Toler of Sneads Ferry. The September wedding  will  take place in New Bern. I want to hibernate, it’s just that cold out! As I read to my 2-year- old the other night, I ran across this sentence, “Falling rain, melting snow, rising creek, our bus won’t go,” from Red Truck by Kersten Hamilton. It made me think about how that really sounds like things we, as humans, say when we are forced to face weather conditions (hard decisions) such as falling rain, melting snow, or freezing rain. We don’t want to go, we don’t want to get out and do things, and we just want to hibernate indoors. • ACCEPTED the resignations of teachers: Jacquelyn Clarke, Louisburg High, Teacher-Exceptional Children; Sarah Lewis (retirement), Terrell Lane Middle/Louisburg High, Teacher-Music. 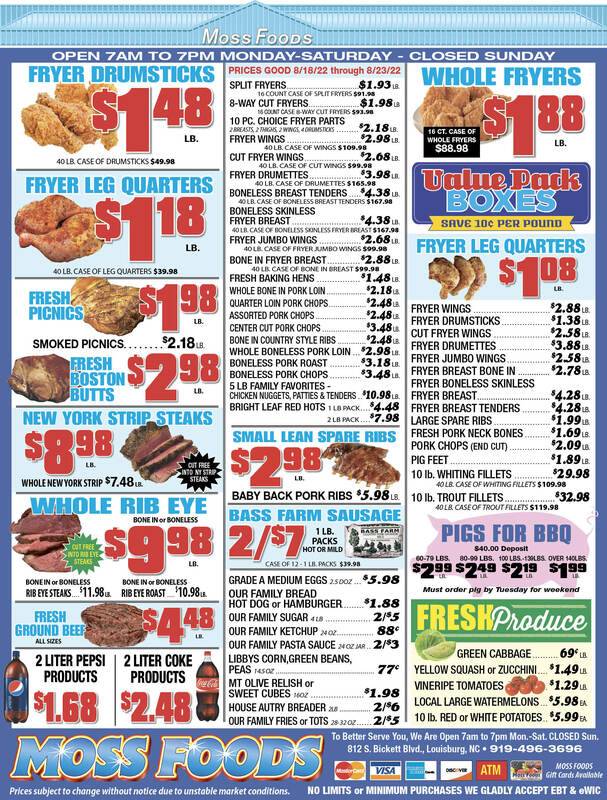 CLIP AND SAVE! Here’s the 2013-14 Franklin County Schools’ calendar as approved recently by the Franklin County Board of Education. And, the school year will likely start a lot sooner than you think, so save this copy! 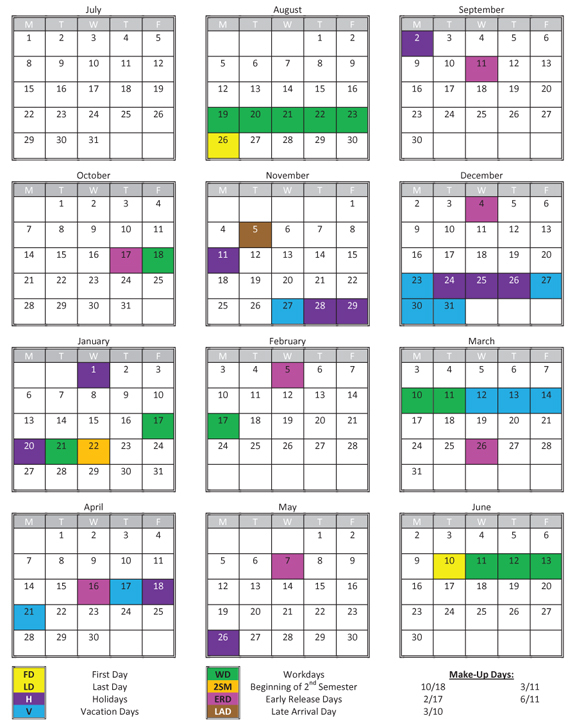 There is a significant change in this calendar from recent school calendars in the county. YOUNGSVILLE — An ordinance that was supposed to clear the way for contractors to build on Saturdays got muddled. As a result, commissioners agreed to wait another month before approving any changes. In January, commissioners ruled that Peachtree Communities violated the town’s nuisance ordinance, which prohibits noisy construction on weekends. YOUNGSVILLE — Commissioners removed the interim from the title of its administrator, discussed plans for a community cleanup day, and moved forward with plans for sidewalks. They were a number of the issues that commissioners worked through during their Feb. 14 meeting. Town officials, staff and commissioners are looking at setting a date to conduct a community cleanup day. 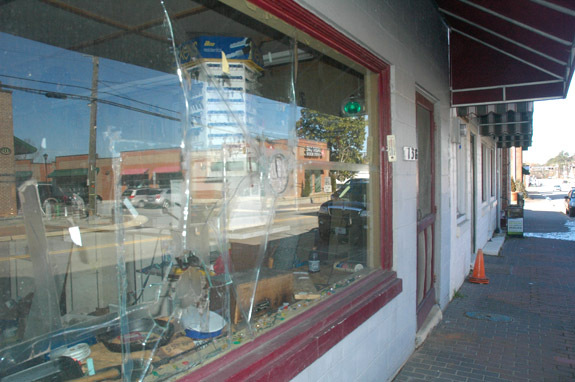 One of the goals is to spruce up some town buildings, like this one downtown, which has a shattered glass window. A Pilot woman was charged with taking a taxi driver for a ride. According to a report by Dep. Taniqua Teasley, a driver with Amigo Taxi in Raleigh reported that someone was trying to skip out on a bill after being driven to a home in the 500 block of Stallings Road. When Teasley arrived, Priana Weathers said she was confronted by a Raleigh officer at WakeMed who accused her of prostitution. The Annual EIA Clinic, conducted for area horse owners, was held Sunday, Feb. 10 at the Farmers Market Shelter in Louisburg. 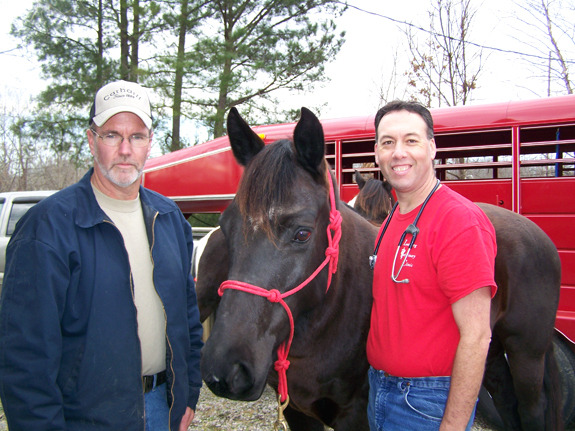 The event, which began over 15 years ago, saves the horse owners money as well as encourages keeping horses healthy with annual vaccinations as well as testing for Equine Infectious Anemia using the Coggins Test. A Franklin County Farmers Market vendors meeting has been slated for 1 p.m. Tuesday, March 12, at the Franklin County Cooperative Extension office, 103 S. Bickett Blvd, Louisburg. Three speakers have been lined up, according to Tracy Perry, agricultural and natural resources technician with the Extension service, as well as an NCDA & CS inspector that will be on hand to test vendor scales. LOUISBURG — A local hospital’s volunteer group is providing scholarship opportunities for students and others looking to go into the medical field. Franklin Regional Medical Center’s volunteer auxiliary will provide the scholarships, ranging from $250 to $1,000, to graduating seniors, hospital volunteers and hospital employees who plan to pursue careers in the medical field. OXFORD – Union Bank & Trust Company announces that C. Boyd Sturges III joined the Board of Directors recently. 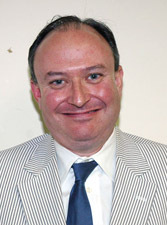 Sturges resides in Louisburg and is a law partner in the Louisburg firm of Davis, Sturges & Tomlinson, Attorneys at Law.